About 25 km before you reach Pangong Tso, you will come across a sign board that reads, ‘Stop here to see rare endemic species marmot’. These endemic rare marmots stay hidden in the potholes and come out often. All you need to do is patiently wait for them to come out. Out of the 14 remaining species of marmots, only two – long-tailed marmot and the Himalayan marmot- are found in India. Pangong lake is a birder’s paradise too. Bird species like Bar-headed goose and Brahmini ducks stroll in the lake when the weather conditions are favorable. It’s a treat to watch them flock around the lake with raw mountains making the perfect frame. That’s picture perfect, right? Given the perfect assimilation of different elements of nature, Pangong Tso lake area makes for a photographer’s perfect muse. Leave the DSLRs alone – even if you take a selfie from an ordinary phone, the beauty of this place makes it look photo shopped. So, go on a photography spree and don’t let your finger rest on the snap button. One must traverse the Chang La Pass before getting down in the valley and heading towards Pangong Tso. You will find army post at Chang La at an altitude of 5300 meters. Stop by to grab some quick bite at the army canteen there. Aloo parantha, toast, sandwich, tea, and Maggi are some of the easily available fast foods options. 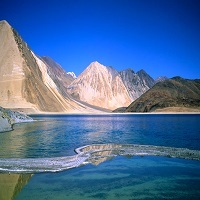 December to February is the ideal time to try some daring activities on the frozen Pangong Tso lake. This is when the extreme cold conditions turn the lake into a sheet of ice and allow you can trek, walk, play ice-hockey, and skate.